Whether you’re in search of an inexpensive snack for the family or silver service, you can find it in the town of Banff, which has over 80 restaurants (more per capita than any town or city across Canada). The quality of food varies greatly. 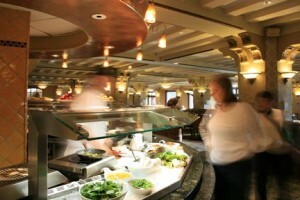 Some restaurants revolve solely around the tourist trade, while others have reputations that attract diners from Calgary who have been known to stay overnight just to eat at their favorite haunt. While the quality of food is most people’s number one priority when dining out, the level of service (or lack of it) also comes into play in Banff, especially if you are paying big bucks for a fine-dining meal. Getting it all right—good food, top-notch service, and a memorable ambiance—in a tourism-oriented town is rare. Which leads to the restaurants I’ve recommended below, the best of a very varied bunch. Banff’s lone bakery is Wild Flour (Bison Courtyard, 211 Bear St., 403/760-5074, 7 a.m. to 6 p.m. daily), and it’s a good one (albeit a little pricey). Organic ingredients are used whenever possible, and everything is freshly baked daily. The result is an array of healthy breads, mouthwatering cakes and pastries, and delicious meat pies. Eat inside or out in the courtyard. Evelyn’s Coffee Bar (119 and 215 Banff Ave., 403/762-0352) has two central locations pouring good coffee and serving huge sandwiches. The few outside tables at 215 Banff Avenue—on the busiest stretch of the busiest street in town—are perfect for people-watching. Banff National Perk (220 Bear St., 403/762-8642) is another local place serving decent coffee and delicious pastries, muffins, and cakes baked daily on the premises. Jump Start (206 Buffalo St., 403/762-0332), opposite Central Park, has a wide range of inexpensive coffee concoctions as well as homemade savories and sandwiches. Two blocks north of downtown, Whitebark Cafe (401 Banff Ave., 403/760-7298, 6:30 a.m. to 5:30 p.m. daily) gives Banff locals and visitors alike an excellent alternative to the downtown cafes, although it’s just a five-minute walk from the heart of town. The coffee poured is as good as anywhere in Banff and teas are sourced from the locally owned Banff Tea Company. All these cafes have free wireless Internet. A town favorite that has faithfully served locals for many years is Melissa’s, housed in a log building two blocks from Banff Avenue that dates from 1928. Lunch and dinner are old-fashioned, casual affairs–choose from a wide variety of generously sized burgers, freshly prepared salads, and Alberta beef. Banff’s original bistro-style restaurant, which opened in the early 1990s, is Coyote’s. Meals are prepared in full view of diners, and the menu emphasizes fresh, health-conscious cooking, with just a hint of Southwestern/Mediterranean style. To start, it’s hard to go past the sweet potato and corn chowder, and then choose from mains such as a flank steak marinated in Cajun spices and topped with a generous dab of corn and tomato salsa and warm shrimp and goat cheese enchilada. The Balkan is run by a local Greek family, but the menu blends their heritage with the cuisines of Italy, China, and Canada. Select from Greek ribs (pork ribs with a lemon sauce), the Greek chow mein (stir-fried vegetables, fried rice, and your choice of meat), or Greek spaghetti. But the most popular dishes are souvlaki and an enormous Greek platter for two. Ticino reflects the heritage of the park’s early mountain guides, with solid timber furnishings, lots of peeled and polished log work, and old wooden skis, huge cowbells, and an alpenhorn decorating the walls. It’s named for the southern province of Switzerland, where the cuisine has a distinctive Italian influence. 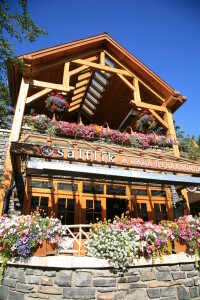 The Swiss chef is best known for a creamy wild mushroom soup, unique to the region; his beef and cheese fondues; juicy cuts of Alberta beef; and veal dishes. Save room for one of Ticino’s sinfully rich desserts. Also of note is professional service. Juniper Bistro is well worth searching out for both Canadian cuisine and unparalleled views across town to Mount Rundle and the Spray Valley. The stylish interior may be inviting, but in warmer weather, you’ll want to be outside on the patio, where the panorama is most spectacular. The menu blends traditional tastes with Canadian produce. If your taste runs toward seafood, there’s grilled calamari as a starter. For those looking for something a little more local, the elk roast is a good choice. Most breakfasts are under $15, while at lunch, the Taste of the Rockies platter for two ($28) is a treat. If you are staying up on Tunnel Mountain—or even if you’re not—Cilantro Mountain Cafe is an excellent choice for a casual, well-priced meal. You can choose to dine inside the cozy log cabin that holds the main restaurant and open kitchen, or out on the patio. Starters are dominated by seafood options, but the flatbread, baked to order and delivered with choice of dips, is a good choice to share. The thin-crust, wood-fired pizza for one is the highlight, with a small but varied selection of other mains that change as seasonal produce becomes available. Highly recommended if you want a break from Banff Avenue. Sleeping Buffalo offers the perfect setting for a moderate splurge away from the bustle of Banff Avenue It features a distinctive interior of hand-hewn cedar beams and old-world elegance–complete with stone fireplace and a chandelier made entirely from elk antlers–along with large windows that frame the surrounding forest. The featured cuisine is referred to as Rocky Mountain, reflecting an abundance of Canadian game and seafood combined with native berries and fruits. The least-expensive way to dine on this uniquely Canadian fare is by visiting at lunch and ordering the Rocky Mountain Game Platter, $24 for two people. Dinner entrees include fare like elk sirloin that’s given an exotic touch with accompanying quince compote. Open: 7:30 a.m. to 9 p.m. daily May to mid-Oct. and 5 to 9 p.m. Fri. to Sun. early Dec. to Apr. The food at Storm Mountain Lodge is excellent, but it’s the ambience you’ll remember long after leaving–an intoxicating blend of historic appeal and rustic mountain charm. The chef uses mostly organic produce with seasonally available game and seafood–bison, venison, wild salmon, and the like–to create tasty and interesting dishes well suited to the I-must-be-in-the-Canadian-wilderness surroundings. Storm Mountain Lodge is a 25-minute drive northwest from Banff; take the TransCanada Highway toward Lake Louise and head west at the Castle Mountain interchange. Occupying the prime position on one of Banff’s busiest corners is the Maple Leaf. Take in the dramatic Canadian-themed decor—exposed river stone, polished log work, a two-story interior rock wall, and a moose head (tucked around the corner from the street-level lounge). Some tables surround a busy area by the bar, so try to talk your way into the upstairs back corner. The cooking uses modern styles with an abundance of Canadian game and produce. The lunch menu has a bison burger, along with lighter salads and gourmet sandwiches. Some of Canada’s finest ingredients appear on the dinner menu: Stuffed halibut and the bacon-wrapped bison tenderloin are standouts. Treat yourself to a glass of Canadian ice wine to accompany dessert. You’ll think you’ve swapped continents when you step into Le Beaujolais, a Canadian leader in French cuisine. With crisp white linens, old-style stately decor, and immaculate service, this elegant room has been one of Banff’s most popular fine-dining restaurants for 30 years. Its second-floor location ensures great views of Banff, especially from window tables. The dishes feature mainly Canadian produce, prepared and served with a traditional French flair. Entrees include Alberta pork chop smothered in bearnaise sauce with a side of king crab meat, but the extent of your final tab depends on whether you choose a la carte items or one of the three- and six-course table d’hote menus ($74 and $95, respectively)—and also on how much wine you consume. Nationalism shows through in the 10,000-bottle cellar, with lots of reds from the Bordeaux and Burgundy regions of France. Reservations are necessary. Within Le Beaujolais, a small area has been set aside as Café de Paris (403/762-5365, from 5 p.m. daily, $26 to $38), a more casual dining experience but with the same views. 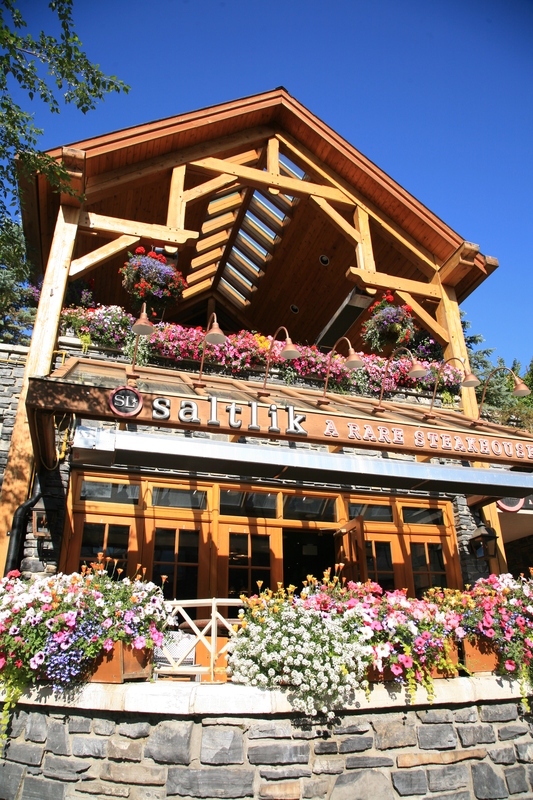 Head to the Saltlik for Banff’s finest steak. Alberta beef is mostly raised on ranchland east of the park and features prominently on menus throughout town. Finely marbled AAA beef is used in most restaurants and is unequaled in its tender, juicy qualities. Both The Keg and Earl’s (see above) offer good quality steaks, but Saltlik is the perfect choice for serious carnivores with cash to spare. Considered one of Banff’s most fashionable restaurants, the room is big and bold, and the concrete-and-steel split-level interior is complemented by modish wood furnishings. Facing the street, glass doors in the street-level lounge fold back to a terrace for warm-weather dining. The specialty is AAA Alberta beef, finished with grain feeding to enhance the flavor, then flash-seared at 650°C (1,200°F) to seal in the juices, and served with a side platter of seasonal vegetables. Entrees are priced comparable to a city steakhouse, but the cost creeps up as you add side dishes. Even if you’ve tried exotic meats, you probably haven’t had them in a restaurant like the Grizzly House, which provides Banff’s most unusual dining experience. The decor is, to say the least, eclectic (many say eccentric)–think lots of twisted woods, a motorbike hanging from the ceiling, a melted telephone on the wall. Each table has a phone for across-table conversation, or you can put a call through to your server, the bar, a cab, diners in the private booth, or even those who spend too long in the bathroom. The food is equally unique, and the service is as professional as anywhere in town. The menu hasn’t changed in decades, and this doesn’t displease anyone. Most dining revolves around traditional Swiss fondues, but with nontraditional dipping meats such as rattlesnake, alligator, shark, ostrich, scallops, elk, and wild boar. Four-course table d’hote fondue dinners are $44 to $64 per person, which includes soup or salad, followed by a cheese fondue, then a choice of one of six meat and seafood fondue (or hot rock) choices, and finally a fruity chocolate fondue. The Grizzly House is also open at lunch, when you can sample Canadian game at reduced prices; wild game meat loaf is $16, and an Alberta-farmed buffalo burger is $18. Whether guests or not, most visitors to Banff drop by to see one of the town’s biggest tourist attractions, and a meal here might not be as expensive as you think. The hotel itself has more eateries than most small towns–from a deli serving slices of pizza to the finest of fine dining in the Banffshire Club. If you are in the mood for a snack such as chili and bread or sandwiches to go, head to the lobby level and the Castle Pantry, which is open 24 hours daily. Impressive buffets are the main draw at the Bow Valley Grill, a pleasantly laid out dining room that seats 275. Each morning from 6:30 a.m. an expansive buffet of hot and cold delicacies, including freshly baked bread and seasonal fruits, is laid out for the masses ($42 per person). Lunch (11:30 a.m. to 5:30 p.m. daily) offers a wide-ranging menu featuring everything from salads to seafood. Through the busiest months of summer, a lunch buffet (11:30 a.m. to 2 p.m. Mon. to Fri., 11:30 a.m. to 4 p.m. Sat., $35) is offered. In summer, evening diners (6 to 9 p.m.) order from a menu that appeals to all tastes, while the rest of the year dinner is offered as a buffet, with a different theme each night. The Sunday brunch (11 a.m. to 2:30 p.m., $48) is legendary, with chefs working at numerous stations scattered around the dining area and an enormous spread not equaled for variety anywhere in the mountains. Reservations are required for Sunday brunch (as far in advance as possible) and dinner. Ensconced in an octagonal room of the Manor Wing, Castello Ristorante (6 to 9:30 p.m. Fri. to Tues., dinner mains $21 to $36) is a seductive dining room with a modern, upscale ambiance. The menu is dominated by Italian favorites, with traditional pastas and specialties such as veal tenderloin. The Rundle Lounge & Hall (from 11:30 a.m. daily) combines an area filled with comfortable sofas with summer outdoor dining and an upstairs piano bar, where most tables offer views down the Bow Valley. Grapes (6 to 9 p.m. daily, $18 to 26) is an intimate yet casual wine bar noted for its fine cheeses, meats, breads, and pates. Fondue is the specialty at the Waldhaus. The hotel’s most acclaimed restaurant is 1888 Chop House (6 to 9 p.m. Tues. to Sat., dinner mains $31 to $50), which seats just 65 diners. This fine-dining restaurant is a bastion of elegance, which begins as you enter a gated entrance. Inside, extravagantly rich wood furnishings, perfectly presented table settings, muted lighting, and impeccably trained staff create an atmosphere as far removed from the surrounding wilderness as is imaginable. Reservations are required. Two restaurants lie within the grounds surrounding the hotel, and both are worthy of consideration. Originally the golf course clubhouse, the Waldhaus Restaurant (6 to 9 p.m. daily, closed Apr., dinner mains $22 to $33) is nestled in a forested area directly below the hotel. The big room is dominated by dark woods and is warmed by an open fireplace. 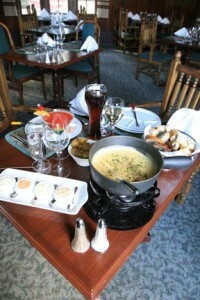 The menu features German specialties, such as fondues. Below the restaurant is a pub of the same name, with a pub-style dinner menu offered in a casual atmosphere. The Golf Course Clubhouse (11:30 a.m. to 5 p.m. daily in summer, dinner mains $15 to $28) is a seasonal restaurant on the golf course proper that serves casual meals throughout the golf season. A shuttle bus runs every 30 minutes between the main lobby and the clubhouse. For all Fairmont Banff Springs dining reservations, call 403/762-2211.